To make the toffee sauce, place the ingredients into a small saucepan and heat gently until the sugar has dissolved. Increase the heat and simmer gently for 2-3 minutes, stirring constantly until the sauce has thickened and coats the back of the spoon. Transfer to a bowl and leave to cool. For the crumble tear the doughnut then place in a food processor and blitz until it resembles fine breadcrumbs, alternatively use a grater. Place the doughnut crumbs into a small mixing bowl and rub in the butter. Preheat the oven to 180°C / 160° Fan /Gas 4. Remove the apple cores using a corer then score around the circumference of each apple with a small, sharp knife. Cut a thin slice from the top and bottom of each apple to produce a flat surface and place the apples in a small baking tin. Mix the raisins with 2 tbsp. of toffee sauce then fill the centre of each apple with the mixture. Spread a thin layer of toffee on top of each apple then pile the crumble mixture on top, pressing down lightly to ensure the crumble sticks. 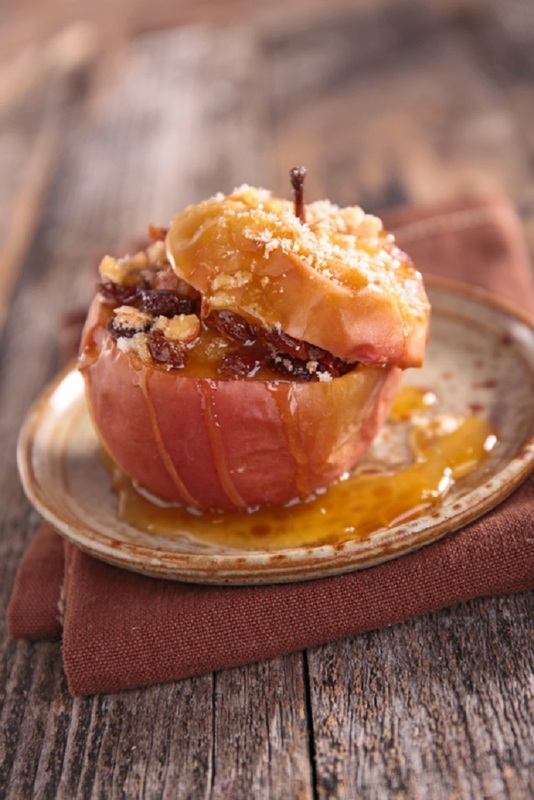 Bake for 25 minutes until the apple is tender and the topping is golden and crisp. Serve warm with a drizzle of toffee sauce. We’ve taken a look at half a dozen of the reasons, macro and micro, for joining the battle to keep our food out of the bin.